What’s this? A new release and not a demo party in sight? I wanted to maintain some momentum this year with the goal of entering another demo into the next Syntax scene party. 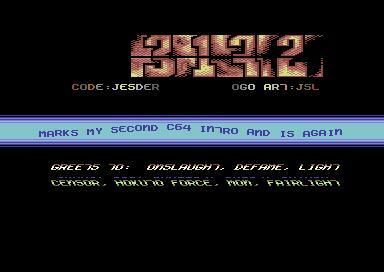 To make that possible, I figure it’s wise to keep active on the C64 and do a few smaller releases over the year. So with that, I present to you a small intro – 3172 – which is heavily influenced by old skool intros and cracktros. In fact, this little intro started out life intended to be a cracktro, but kept having more things added to it. Before I knew it, the cracktro had morphed to include a nice transition in from BASIC, logo fades + pallet swaps, colour cycling, animated rasters, wave text and a few other small things. The code is made up if two parts – the loader and intro code. I have a custom build script which builds both files and then merges the intro code into the loader for the final .prg file. The experience in putting this intro together has been very valuable. While putting Syntro together for Syntax#14, I learnt a lot about how to actually follow a demo through to completion and the various problems that arise along the way. I used that experience to implement a few new approaches with this intro, which certainly made a difference when getting 3172 to the finish line. Again, new issues cropped up and i’ll now spend some time looking again at how I can improve my work and use that towards the next intro / demo. For a small behind the scenes look, here is the intro running with some debug raster rendering, which shows where many of the interrupts occur and how much raster time they are taking up. The large yellow block that starts at the bottom and wraps to the top is the dycp scroller rendering. The light blue is the music player and the rest are all various updates, renders, bank swaps, etc. Very nice! I love the old school effects. I’m trying to code a demo myself and learning all over again since the last time i coded in the late 80s/early 90s. I briefly looked att your source and it looks very good. But how about to break out the dycp part? It would be great to see that part in separate file. Thanks for the feedback. When I put the intro together, I worked on each part in isolation. So I have the dycp scroller (and other parts) all in individual files. Then as the intro comes together, the parts get merged in and code shuffled around so it all works and the rasters get along together. When I merged the dycp scroller in, it became somewhat fragmented to ensure it fit within available raster spaces. I still have the original dycp scroller asm file so will place a link up for it shortly. Like your articles, very useful.